Haven’t had a chance to join one of our educational paddle trips yet? Take a look at what you’re missing! Interested in getting out on the river? Come join one of our public educational paddle trips! Friends of the Kaw guides student and public educational paddle trips for paddlers of all ages and experience levels. We provide canoes or double kayaks, paddles and PFDs (personal floatation device), basic instruction, safety information, and an educational sandbar seminar. 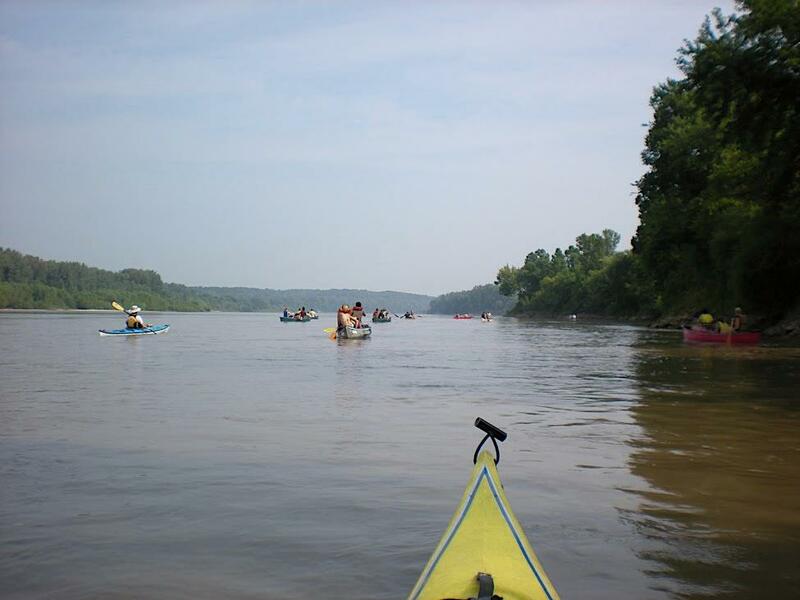 The purpose of our paddle trips is to educate groups on the Kansas river system, including ecology, watersheds, and human impacts on the water. If your group is more interested in a purely recreational paddle, we recommend visiting one of the kayak/canoe rental companies located along the river. Check out our calendar at http://www.kansasriver.org/calendar and click on the Registration link to sign up. We will meet and unload at the starting boat ramp, then drivers will move their cars to the end point and volunteers will shuttle them back so that you can leave immediately after finishing the paddle. We’ll stop halfway through the trip and pull over to a sandbar. There we’ll provide snacks and an educational talk. All trips (with the exception of DeSoto to Cedar Creek) are roughly 10 miles long. Including the pre-paddle safety talk, sandbar stop, and getting into and out of boat, plan on being out about 5 to 6 hours. To learn more, check out our video “KNOW BEFORE YOU GO” to learn about our trips before you get there! To join a paddle trip, check out our calendar at http://www.kansasriver.org/calendar, find a date/trip that interested you and then click on the Registration link to sign up. FOK Canoe or Double Kayak with paddle and lifejacket: $30 per person ($60 per boat, kids in middle of a canoe are free). It is our policy that no refunds are given if you cancel within a week of the trip. In the event of a cancellation due to weather we will make an exception, but we will attempt to reschedule first. All participants must wear a PFD (personal flotation device) while on the water and sign a liability waiver. Children under 12 must wear a PFD at all times, Kansas law. We recommend participants wear lightweight clothing, shoes that can handle getting wet/muddy and securely strap to your feet. It’s important to drink the lots of water the day before a trip and bring at least 1 gallon of water per person. We do not allow the consumption of alcoholic beverages immediately before, or during our float trips. We do not allow dogs on our trips. We do not allow children under the Age of 5 on our trips.